Renowned architecture firm Adrian Smith + Gordon Gill (AS+GG) recently completed the investigation phase of a massive plan to “decarbonize” Chicago’s Loop. The firm’s goal was to assess variables such as the age, use, condition, and energy consumption of the 500 buildings in this central core area of the city. Carried out in cooperation with the Chicago Climate Action Plan, the monumental project calls for a retrofit of half the city’s commercial and residential buildings to result in a 30% reduction in energy use by 2020. AS+GG took on this tall order with very well thought-out, research based, holistic ideas that beg to be implemented. The breadth of the initial phase of the Chicago Central Area DeCarbonization Plan proposes eight key strategies to meet the city’s carbon reduction goals. The first, “Buildings,” discourages new construction, and focuses on retrofitting existing structures to increase their energy efficiency, raising the value of aging building stock and tapping into the potential to transfer excess energy loads back to the grid. “Urban Matrix,” promotes residential use of the Loop area by convert outdated office buildings into homes, schools and other services. Their “Smart Infrastructure” strategy explores energy generation, storage and distribution. “Mobility” assesses public transit and connectivity. “Water,” examines resource conservation, “Energy” highlights new and existing sources of power, and “Waste,” looks at the city’s system for processing, reducing, recycling, and disposing of garbage. Lastly, “Community Engagement” outlines ideas for involving the city’s inhabitants in the greening process. Several concepts were presented with these strategies, such as plans to create a below-grade walkway system that would make city pedestrian friendly in extreme weather conditions. There was also an idea to use the Loop’s underground tunnels for an air-powered waste disposal system. 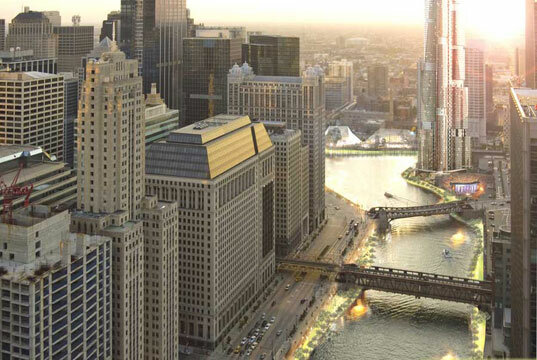 Extensions for the Chicago River walking and biking paths are also called for. 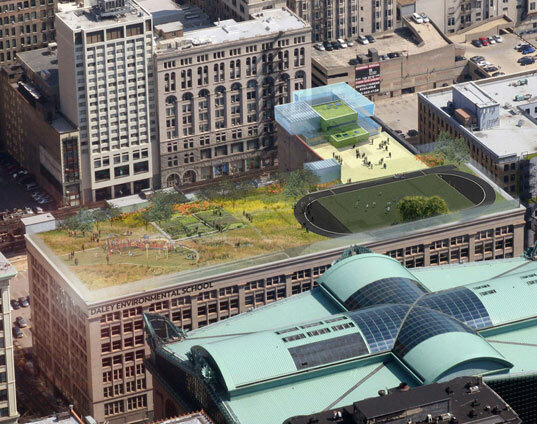 We love that they also suggest publishing a standardized textbook for all city schools that would teach urban design and decarbonization for public school students. Adrian Smith summarized the plan for the attendees of the Council on Tall Buildings and Urban Habitat (CTBUH) 2009 Conference last fall. The event, dubbed “Evolution of the Skyscraper: New Challenges in a World of Global Warming and Recession,” was the perfect place to exhibit the firm’s proposal. 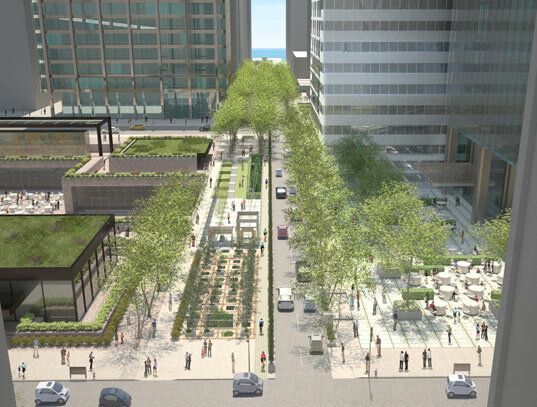 They also proved that it could be put in action by showing plans for the green retrofit for Willis Tower (formerly the Sears Tower). AS+GG has also included a full analysis of the funding resources available to help developers and existing building owners defray the cost of green retrofits and other sustainable measures. In addition, they created a parametric model to be used to calculating carbon savings achieved by various changes they are suggesting. AS+GG are people to trust on the subject of green architecture and city planning. Their experience includes the development of an energy master plan for Dubai and the Jumeira Gardens skyscrapers. They are also responsible for the world’s first energy positive building in Abu Dhabi. We hope their reputation with these sustainable efforts will push decision makers to move the decarbonization plan forward. It is obvious that they want to prove beyond a doubt that these changes are necessary and achievable, and Chicagoans like myself thank them for it. This is only the beginning of the plan, and we will be keeping an eye on what AS+GG will be doing next. The second phase of the DeCarbonization Plan will focus on adapting it to meet the energy and carbon reduction goals of university and medical campuses, towns, cities, states and countries around the globe. Recently, interest has grown much air thermal power plants, there were a lot of articles and dissertations, research and commercial bids for construction. For example the use of the effect of Solar Chimney in Kingdom Tower skyscraper in Abu Dhabi, UAE. This creates prerequisites for large-scale study of the phenomenon generating electrical energy from controlled vertical air flow. Unlike a conventional stations from wind turbines is that there is an artificial air flow and it can be adjusted, as in hydroelectric power plants, while wind turbines can not regulate - they must be put where the wind blows from high annual averages. Solar Chimney, built in Spain it was the first step and not successful, to pay to obtain 50 kW of power 12 million marks at the time was a great luxury. Intentions of the architects "Adrian Smith + Gordon Gill" to use this system Solar Chimney may be tempting, but why not consider a later concept called "Trailing Solar Chimney", created by me in conjunction with the company "Schlaih Bergermann und Parner"? This concept is more productive than the previous one, according to theoretical estimated at an altitude of 578 m stationary plant for the production of electrical energy of the vortex is able to produce 100 MW. Given that the height of 1600 meters skyscraper several helical turbine in accordance with my invention № 1319654 ( look http://www.solar-tower.org.uk/news-informations-en.php), located at a height of buildings and creating local eddies could give Number of such power that it would be enough for an entire city, such as Abu Dhabi. Energy-independent skyscrapers containing, for example, vortex power plant with a spiral or spherical turbine can drive through the induction of Chicago was able to filter and dispose of them at a height where there is a scattering of electrified particles. And we must note that this needed to use compressors, electric power is generated by the same eddy stations. There is nothing original or innovative about this document. Change light bulbs, plant trees, ride bikes, use less water, use renewable energy--I'm pretty sure that was all suggested a long time ago and there is nothing compelling about it. The below grade walkway has always been part of the city master plan. This is mere marketing by an architecture office. What's really compelling is that when you look at the rest of the architect's web site, it's full of glass box buildings. How does the use of possibly the most energy inefficient cladding system known to man support their "vision" of carbon reduction? Renowned architecture firm Adrian Smith + Gordon Gill (AS+GG) recently completed the investigation phase of a massive plan to "decarbonize" Chicago’s Loop. The firm’s goal was to assess variables such as the age, use, condition, and energy consumption of the 500 buildings in this central core area of the city. Carried out in cooperation with the Chicago Climate Action Plan, the monumental project calls for a retrofit of half the city’s commercial and residential buildings to result in a 30% reduction in energy use by 2020. AS+GG took on this tall order with very well thought-out, research based, holistic ideas that beg to be implemented.